Urban development. A six-month undertaking in sight. Since mid-October several companies have worked on the lower part of the wall of St Michel's Abbey in an endeavour to erase the outrage of time. About one year ago, part of the wall supporting the gardens had collapsed. Following this unexpected accident, the aperos-concerts had to be exiled to the area surrounding the parc Foucaud. To Pierre Nouvialle, president of TAG, there is no doubt the events will again be held in the abbey gardens by 2010. Some will be delighted at the prospect while others will mourn the greenery of the park. The City Hall, meanwhile, launched the works – after archeologists inspected the site and deemed it of no archeological interest, Deputy Mayor Alain Costes said. The wall is being reinforced with repeated concrete projections. Modern-day techniques such as concreting and iron frameworks can be relied upon to consolidate a structure that has been worn out by time and water erosion. The undertaking requires the savoir-faire MTPS is able to offer. 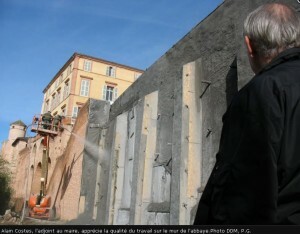 Bulditec will later step in to return the wall to its original aspect. "The old bricks have been reclaimed and the company is seeking others in order to preserve the original aspect of the abbey," Alain Costes explained. The Deputy Mayor also indicated that the gardens must be redesigned in order to widen the space dedicated to 'apéros-concerts'. "We may remove a hedge for space. Next, we'll have a choice between building a parapet on the low wall similar to the one in the yard, and planting a new hedge along the wall. But nothing has been decided yet." Not counting the garden landscaping, the estimated cost for the wall is 200,000 euros. Fortunately the insurance policy the City Hall subscribed must pay 160,000 euros following the collapse.